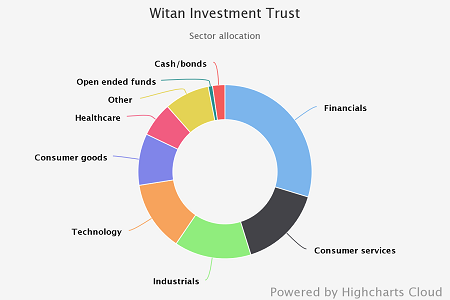 Witan is one of the UK’s largest investment trusts and aims for capital growth and an income which rises faster than inflation, with a portfolio of global equities managed by a number of third party management groups overseen by chief executive Andrew Bell. 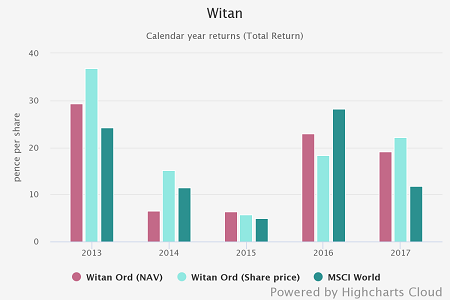 Witan has performed strongly over the past year, and delivering NAV total returns of 17.8%, in comparison to the benchmark total return of 14.2% (full year to 31.01.2018). For the same period, the share price total return is +21.4%. Since the start of January 2017, Witan’s benchmark has been a composite of 30% FTSE All-Share, 25% FTSE All-World North America, 20% FTSE All-World Asia Pacific, 20% FTSE All-World Europe (ex UK), 5% FTSE All-World Emerging Markets. Since Andrew Bell took over as CEO in 2010 the trust has performed well – outperforming the board’s customised benchmark on a NAV basis in four of the past five years. On a NAV total return basis, it has also outperformed the MSCI All Countries World Index, and the average trust in the AIC Global sector over Andrew's tenure. During 2017, the board bought shares 2,857,284 shares, demonstrating the boards policy to use buybacks to achieve a "sustainable low discount (or premium) to NAV... taking account of prevailing investment conditions". The trust has traded on an average discount of -2.3% over the course of the year to 5 March 2018 according to data from Morningstar. Witan has a multi-manager approach, largely using a range of third party managers investing in concentrated portfolios. The trust achieves diversification by using regional or global specialists, and over time, hope to achieve dynamic asset allocation without having to change managers by giving them relatively broad geographical mandates. Witan believes that it can be considered an active manager of active managers, and that its portfolio will consist of ten to fifteen “non-core” managers, which will be more interesting in terms of “active share” than ten 'core' managers which might be expected to have a higher degree of overlap. Andrew Bell, the CEO, also controls some of the trust’s AUM, investing in special situations and sector views. The result is a portfolio with broad diversification and low concentration; the top ten holdings only represent 15.2% of NAV, and overall the trust has just shy of 400 holdings. We understand that each sub-manager has relatively little overlap with each other - Witan favours non-index hugging managers who are typically relatively concentrated, with the most concentrated having below 20 stocks in the portfolio. The most important unifying characteristic between the third-party managers, is that each of them is truly 'active'. The stable of managers now constitutes eleven managers. Witan appointed two new European equity managers towards the end of 2017, Crux AM (5%) and SW Mitchell Capital (5%). The majority of the assets controlled by these two were funded by the termination of Marathon AM, who had previously managed 8.2% of Witan's AUM (as of 30.06.17). The trust has an equity benchmark set by the board, which constitutes the main investment geographies, weighted by the board. The largest weighting is in the UK (34%), followed by Europe (23%), North America (22%), the Far East (15%), Japan (5%). Andrew claims to not pay too much heed to these weightings when they are selecting managers. 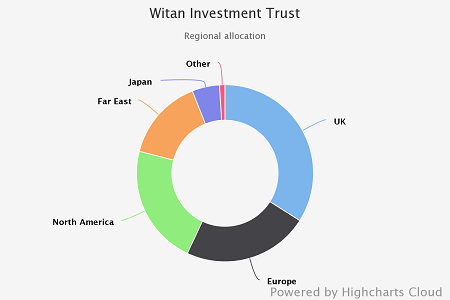 Relative to this benchmark, the Witan portfolio overall is mainly overweight to the UK. Witan employs structural gearing to enhance returns for shareholders. It is the board’s longstanding policy not to allow gearing to rise to more than 20%, other than temporarily in exceptional circumstances. According to the company, over the past five years it has generally varied between 5% and 15%. At the time of writing, gearing equates to 9%. 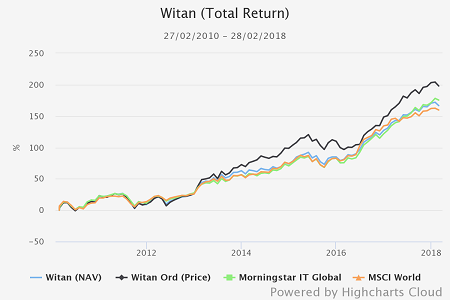 Although it lags the average trust in the Morningstar IT Global sector (22.3%) Witan has performed well over the past year, delivering NAV total returns of 17.8% while the MSCI World index - which we use as a comparator for illustrative purposes (the trust's benchmark is a custom composite of various indices) - delivered 11.3%. For the same period, the share price total return is +21.4%. Since Andrew Bell took over as CEO in 2010, the trust has performed well – outperforming the MSCI World index by a margin of around 7% on a NAV basis. 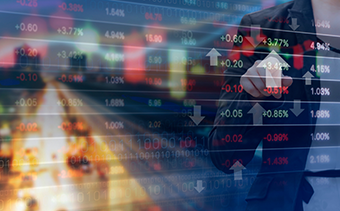 The trust has delivered fairly consistent returns, too, with NAV total returns ahead of the index in three of the past five years according to data from Morningstar. It is the board’s policy each year to grow the dividend ahead of inflation. Over the past 5 years the dividend has grown 9.3%, in comparison, the AIC Global Sector peer group average is 2.7%. The dividend is paid quarterly, at the current share price, the shares yield 1.94% (January 2018). However, this current dividend yield is slightly less than the 4 year average, which is 2.01% to the end of December 2017. Witan is internally managed and is headed by Andrew Bell who became chief executive in 2010. Andrew was previously head of research at Rensburg Sheppards (the wealth manager, subsequently bought by Investec Wealth) and he has reinvigorated the multi-manager approach having had two rounds of changes in managers in 2010 and then 2013. Changes to the underlying line-up of managers are relatively infrequent, although 2017 brought about four changes. GQG (an Emerging Markets manager) was appointed in February 2017 with a relatively small allocation of 4% of total assets as well as two new European equity managers, Crux AM (5%) and SW Mitchell Capital (5%), which replace Marathon Asset Management, now no longer associated with the portfolio. The chief executive is supported by a team of six, farming out most (but not all) of its investment management to around 10-15 active third-party managers around the world, primarily using managed accounts. Witan is able to use its large size (total assets of £2.1bn) to negotiate fees with the managers it has selected. The chief executive and his team retain up to 10% of the trust’s assets to invest direct, and this has historically been used to invest in listed funds to get exposure to other asset classes or special situations. Witan was originally formed to manage the wealth of Lord Farringdon (the head of the Henderson family). The current chairman is his descendant, Harry Henderson, who owns a stake worth c. £8m – which, in Alan Brierley of Canaccord’s language, represents a lot of 'skin in the game'. 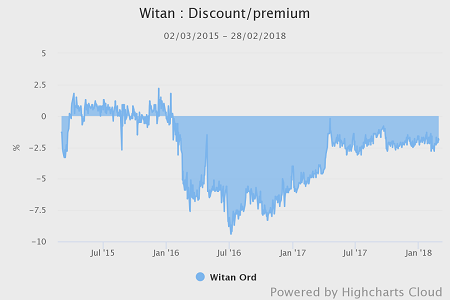 In 2015 Witan traded very close to NAV and was able to issue over £75m worth of stock, representing quite a turnaround since it started buying shares back in December 2004. However, as the graph below illustrates, Witan suffered something of a de-rating during 2016. This began with a little indigestion in the market after an institutional seller dumped a large chunk of stock on the market, but this was subsequently compounded by the broad de-rating which followed the referendum. During 2017, the board bought shares 2,857,284 shares with the average discount for this period being 1.99%. This demonstrated the boards policy to use buybacks to achieve a "sustainable low discount (or premium) to NAV... taking account of prevailing investment conditions"
Multi-manager funds are often criticised for being expensive, however Witan uses its significant size to negotiate management fees with the underlying portfolio’s managers which are at as keen a price as possible. In 2017 base management fees among the 11 groups which run money for Witan ranged from 0.2% to 0.8% per annum, with the weighted average being 0.49 % as of 2017. Performance fees range from nil to 20% of outperformance, and across the portfolio, the weighted average is 5% of the outperformance of the relevant benchmark. The trust has an ongoing charge figure (OCF) of 0.75%. Witan is moderately more expensive than the Global investment trust peer group (which has an average OCF of 0.63%). No performance fee is levied. The KID 'impact on return' cost as at 31st December 2017 was 1.9%.